At QuakeCon 2018 id Software confirmed that DOOM Eternal won’t feature the SnapMap editor seen in 2016’s DOOM game. However, speaking to PCGamesN Director Marty Stratton didn’t leave the door completely shut off to proper mods. We had made some technical decisions way back that just pushed us in a different direction than mods. We have spent the last several years making technical decisions that get us back towards being able to do mods. So I can’t say that it’s right on the horizon or right around the corner, but it’s important to me. It’s important to Robert Duffy, our CTO. We have definitely swung the pendulum back pretty far towards being able to that. 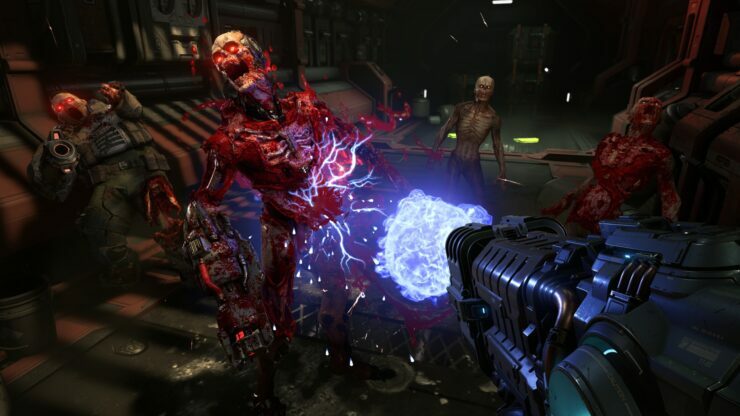 With regards to the technical side, DOOM Eternal (powered by the new id Tech 7 engine) was running on a high-end PC and Stratton confirmed to be targeting 60FPS on consoles with the except of the Nintendo Switch, where the game will run at 30FPS due to hardware limitations. Last but not least, in an interview with Eurogamer Stratton briefly discussed the developer’s entirely new approach to PvP. We’re approaching the whole social side of playing Doom a bit differently. The Invasion is one of the ways you can play the Doom dance in a social way, but we are also working on a PvP component, but not the way we did it last time, a new approach to it. We’ll be talking about it a lot more further down the road but it is a much more Doom-centric experience and we’re developing it internally this time. The Doom dance with your friends is a really big thing for us. We wanted to make sure everybody understood, first and foremost, we’re taking the campaign and the Doom Slayer and giving a completely blown-out-the-top version of everything they love, but the social side, as people will see when we start to talk about that, is a really big thing for us. In case you missed the stunning DOOM Eternal gameplay reveal, check out our story from this weekend.